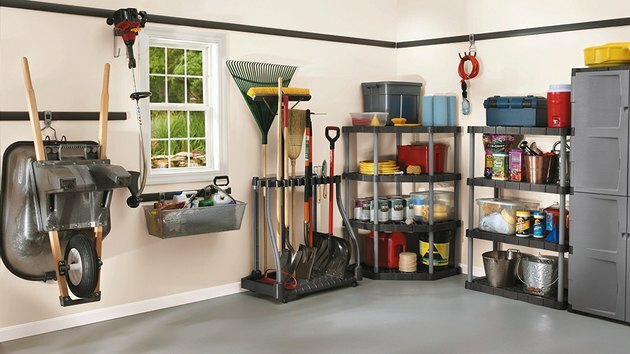 Rubbermaid offers a budget-friendly garage storage system that's primarily constructed of a resin material. Before choosing a storage system, take some time to cull out broken and unused items. Give away, sell, or recycle things that have become clutter. Then, group items you plan to keep in general categories, such as tools, sports equipment, lawn and garden, seasonal decor, and parts and supplies for various projects. Now you can assess your true storage needs. 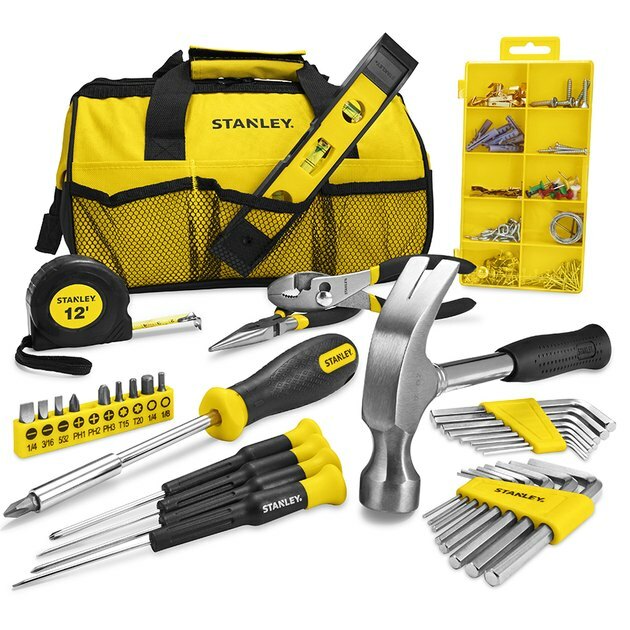 For example, if you own just a set of basic household tools, you won't need to invest in a large rolling tool chest. However, you may need lots of heavy-duty shelving and specialized hooks to hold things like sports and camping gear. You can store a tool case in a cabinet or on a heavy-duty shelf . Not everyone needs a large tool chest. Garage storage systems are built to organize and protect your belongings, including some very heavy, oversized items. Storage cabinets are often on wheels to provide flexibility. You can move equipment close to a work area, clean up underneath and behind units, and reconfigure storage pieces as needed. When shopping for a storage system, select products that will meet your current needs and allow for expansion in the future. Your budget will dictate both the quality and quantity of storage pieces you can purchase initially. Because storage systems are modular, you'll be able to add units in the future. Durability of materials is reflected in the overall cost. Budget-friendly systems are usually made of resin, whereas high-end systems are manufactured from steel. If you have a collection of expensive hand and power tools, you will likely want to invest in appropriate storage pieces. Safety should be a priority. Purchase a cabinet that locks shut to keep children away from hazardous fluids, such as caustic cleansers, fertilizers, pesticides, and antifreeze. Ensure shelves are built to support extra-heavy items. Look for ease of assembly and installation. Identify your unique storage needs, such as limited floor space or oversized items such as a kayak. Don't neglect aesthetics. It's your workspace, so choose cabinets that reflect your taste. If you plan to spend a lot of time in your garage, you might want to include a television, small refrigerator, and a couple of stools. These additions can make DIY projects a lot more fun with a friend. 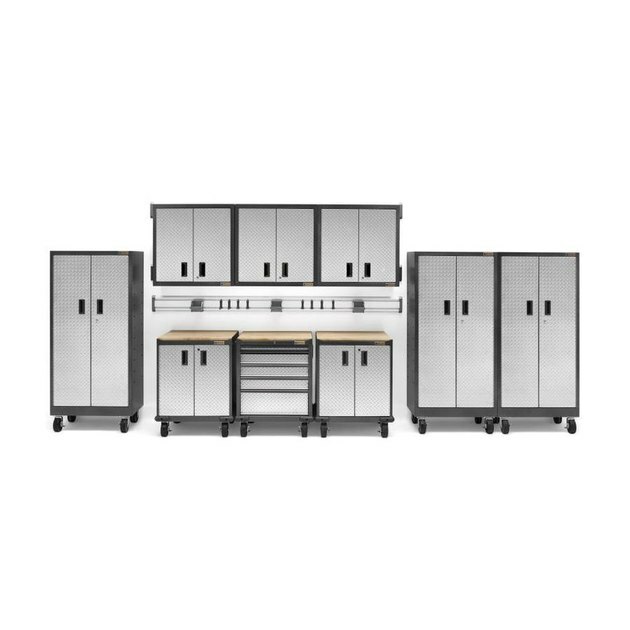 Gladiator's steel modular storage systems provide flexible workspace and storage. Garage storage system manufacturers, such as Gladiator, offer free design tools on their websites. Use the tools to plan which units will hold your belongings and where those storage units will fit into your space. This is when all your preliminary work will pay off because you can assess how many shelves and cabinets you need, and which specialty hooks and wall systems need to be installed. Be sure to reserve adequate space for vehicles, as well as for waste and recycling containers. Also, consider who needs to access which items and how frequently. Cabinets protect tools and supplies from dust and dirt. Locked doors protect children from potentially dangerous chemicals. Wall systems (slatwall or pegboard) keep smaller gear off the floor. Workbenches provide a sturdy, accessible work area at just the right height. Shelving holds a wide range of items and bins. Pay attention to load capacity. 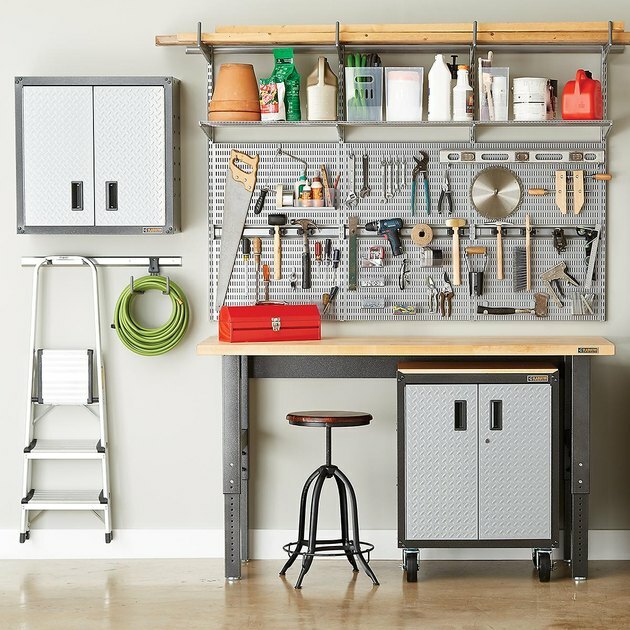 Pegboard and specialty hooks elevate bicycles, wheelbarrows, hoses, and more. Baskets and bins store smaller items and can be moved easily. Consider using clear or color-coded bins so you know what's inside them without having to dig through multiple bins to find an item. Retailers offer bins in seasonal colors so you can easily identify holiday decor and rotate it on shelves or in overhead storage. Tool storage keeps valuable equipment clean, organized, and accessible. Overhead garage storage shelves that mount on the ceiling free up valuable wall and floor space, however, they are inconvenient for frequently used items. Make sure shelves won't interfere with your garage door operation. Small spaces can be efficient and orderly. The following manufacturers offer garage storage components.